To complete our simulation of a moving ground plane, we are able to rotate the wheels to match the wind speed. This, coupled with our boundary layer control, allows us to simulate what the car experiences while on the track. 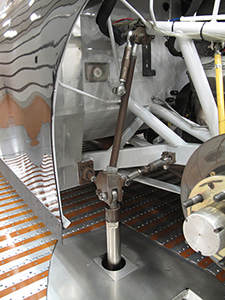 Unlike most wind tunnels, AeroDyn yaws the vehicle about the front axle, similar to what is seen on track. 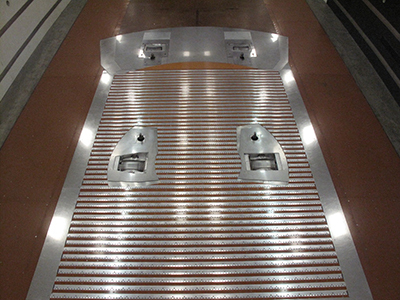 Our tunnel is able to yaw the vehicle from +3° to – 5°. This automation allows for quick aero-mapping with precise, repeatable results. Our in-house designed Ride Height Control System (RHCS) revolutionized the way we do testing. This is the 3rd generation of our RHCS, that allows precise movements to .001″. 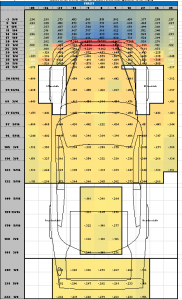 The best part of our RHCS is the ease for our customers to create complex ride height maps that are loaded into our RHCS via a simple Excel Spreadsheet. The system also allows for manual fine tuning by the customer in the tunnel. Although AeroDyn specializes in servicing NASCAR race teams, our wind tunnel is adaptable to fit a wide array of vehicles. To the left you will find pictures of our mounting hardware that we supply. We will provide information on what teams can do to adapt their vehicle to work with our computer controlled adjustable ride height system and spinning wheels. We have successfully mounted IMSA, Trans Am, and OEM vehicles to our RHCS. Please contact us to see what we can do to accommodate your vehicle in our facility. 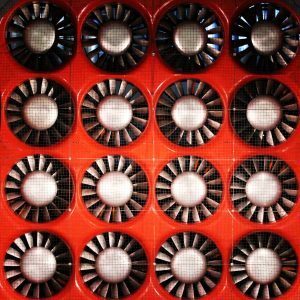 Unlike other tunnels, the AeroDyn Wind Tunnel features 22 individual fans. This allows for rapid start up and shut down. We leverage active fan breaking to slow the fans down after a run allowing a fast turn around. Our focus is on increasing productivity and providing the best value for our customers. 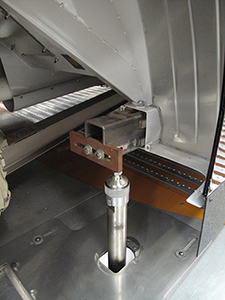 Because of our unique boundary layer control solution, we are able to provide customers with unprecedented instrumentation of the underbody. Beneath the car, integrated into our floor, we have a grid of 264 static pressures. In addition, we can interface with up to 62 customer supplied vehicle pressure taps. Contact us for more information on integrating with our vehicle pressure data acquisition system.